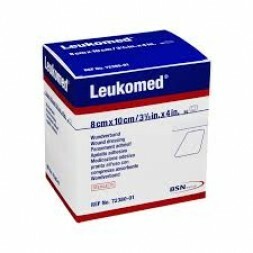 Leukomed is a convenient solution for traumatic and surgical wounds with a low infection risk. Leukomed is a non-woven absorbent wound dressing using Fixomull technology and is suitable for low to moderately exuding wounds. This dressing offers a reliable and gently adhesive ensuring wearer comfort. The rounded edges reduce the occurrence of roll back and snagging to clothes and sheets, helping the dressing stay in place for longer. The absorbent wound pad allows for a reduced number of dressing changes saving on both cost and time. A non-woven cushion effect dressing to prevent skin maceration and tension blisters. This easy to apply dressing is suitable for short time use on all skin types to cover surgical or traumatic wounds.